The VIBRASCOPE™ helps you to check out subtle energies for yourself. Dowsing is made easy with this highly tuned instrument. 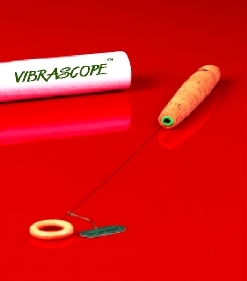 An Accurate, Innovative and Easy to Use Dowsing Tool! The 24ct gold-plated antenna makes the Vibrascope a highly sensitive and accurate testing tool, assisting you in determining the efficacy and benefit of vibrational remedies, allopathic medicines, gemstones and more. You can also use it to investigate food-tolerances, incompatibilities and allergies and to establish sites of ley-lines and electromagnetic stress. Due to its high sensitivity and accuracy, it is easy to use and ideal for beginners also. Through the employment of natural materials, the Vibrascope is very light in weight and, with its cork insulation, uses very little body-energy. These factors enable you to enjoy it for long periods without tiring. If you use the Vibrascope as a 'pendulum' or for its unique 'Response Test', the clearly defined instructions will help you on the way. The Vibrascope comes in a hard card-board tube for storage. A useful product with many exciting applications. A high quality, easy to use, reliable tool at an affordable price – excellent value for money! I have been working for a long time with a Vibrascope for the differentiation of homeopathic medicines. It is probably the most simple, exact and direct way of finding a medicine. As with all dowsing equipment, it takes time and practice to perfect your skill. This Dowsing rod is probably easier to use than most due to its fine balance and good response. For more details on dowsing please see the British Society of Dowsers website.